Yesterday I was being brave at my parents’ house and decided to try turning on the computer myself. I went down the checklist and turned on the computer, but the broadband modem wouldn’t turn on. After many minutes of jiggling wires and testing for loose connections I finally discovered this small button on the back panel of the modem – another switch – and of course it had been switched off. Its almost as if we revel in taking something simple like switching on the TV and and making a sacred ritual out of it – a complicated series of actions which cannot be executed without rigorous training and is designed to obfuscate outsiders. I used to find this exasperating until I got interested in clean tech last year. 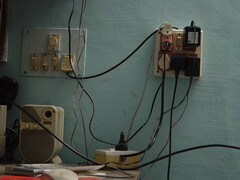 It turns out that the Indian approach to turning off power to appliances that are idle actually does save electricity. It probably also extends the life of the appliances, though I haven’t read any research on that. In the US on the other hand, there is almost no attention paid to what is called “standby power” – the power consumption by appliances, especially modern, intelligent electronic appliances, when they are idle but not turned off. Standby power is a big source of lost energy. Lawrence Berkeley Labs has a website dedicated to educating the public about standby power. According to them, a typical American home spends as much as 10% of its power consumption on standby power. … mother lived the latter years of her life in the horrible suspicion that electricity was dripping invisibly all over the house. because of which she would go around turning switches off all over the house even if there was nothing plugged into them. I suspect most Indians won’t find this funny. Switching off stuff comes naturally to them. And if a good percentage of them don’t know that electric current doesn’t flow unless the circuit is completed, that’s natural. The other thing that is “piped” into the home is water and that drips all the time. On the other hand, I don’t know if too many Americans find this funny either. If two thirds of them believe that Obama is a Muslim and a whole bunch of others hold these kooky beliefs I think there must be a lot of people like Thurber’s mother out there. This entry was posted in Uncategorized and tagged Humour, Sustainable Living. Bookmark the permalink. The picture says a thousand words! Actually I came across a startup working in this area recently. If I remember correctly, the startup is working with OEMs to incorporate their energy saving (no/much lower standby power) directly into their chips or PCBs.